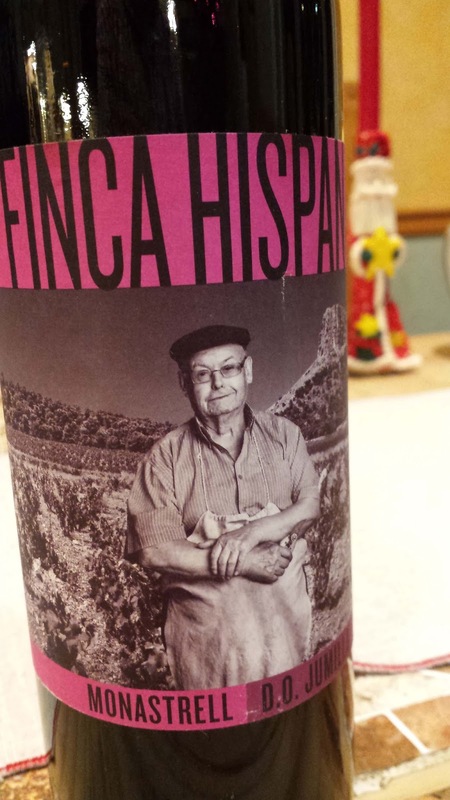 Spain's wine culture is as rich and diverse as any country and one brand attempting to capture this complete image is Finca Hispana. They produce wines from indigenous varieties grown in ten unique regions from Rioja to Priorat and from Cava to Sherry. And the varieties include Tempranillo, Garnacha, Cariñena, Monastrell (Mourvedre) and Garnacha Blanca. 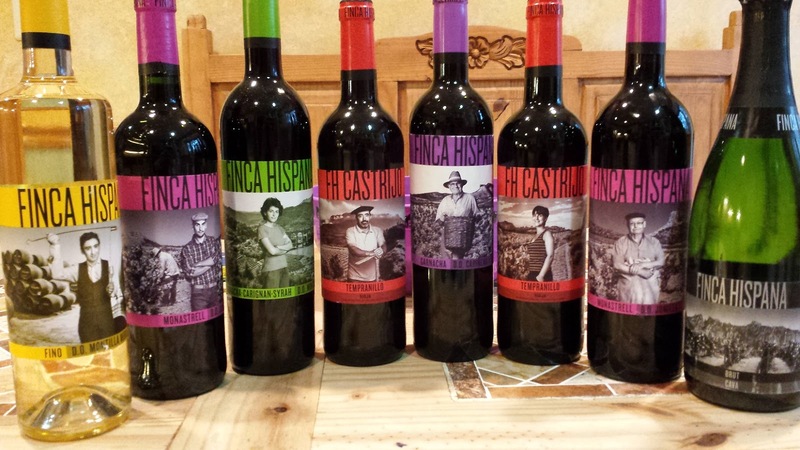 Each Finca Hispana wine showcases not only the region and grape variety, but also the winemakers - who are displayed proudly on each label. In 2015 these wines started arriving in the United States and are priced very modestly at $15. I recently received a care package and here are the highlights. FH Garnacha-Carignan-Syrah - The blend consists of 40% Garnacha, 40% Carignan, 20% Syrah all from vines aged between 30-60 years old in DO Monsant - the center of Catalonia and surrounding DOQ Priorat. 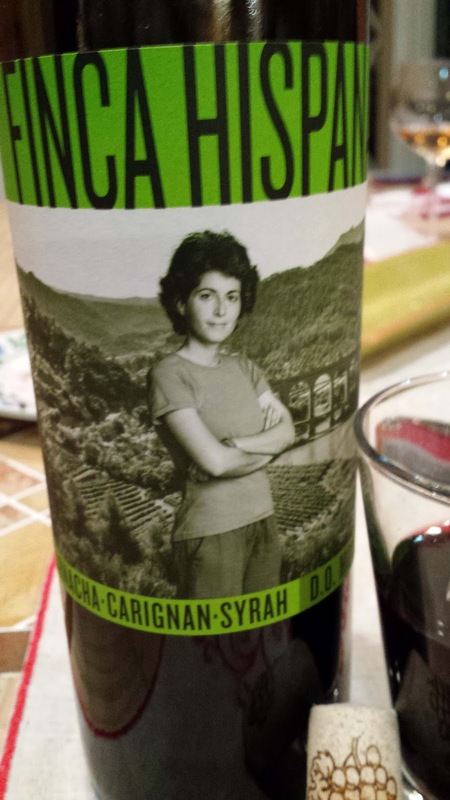 This complex but approachable wine is produced by Eugènia Guasch López. FH Garnacha Barrica, 2011 D.O. Carinena - José Maria Valero tends 100 year old vines in Cariñena, situated on the high plains of the ancient Kingdom of Aragon in northern Spain. The wine starts with a creamy mouthful of dark cherries which leads to mild acids and easy tannins. My favorite. FH Castrijo Joven, 2012 DOC Rioja - José Ayala Salazar began working in his father’s vineyard at the age of six. Now he works 40-80 years old vines in the Labastida region, the highest and most northern area in Rioja. The wine stresses bright berry fruit followed by a creamy texture and subtle tannins. 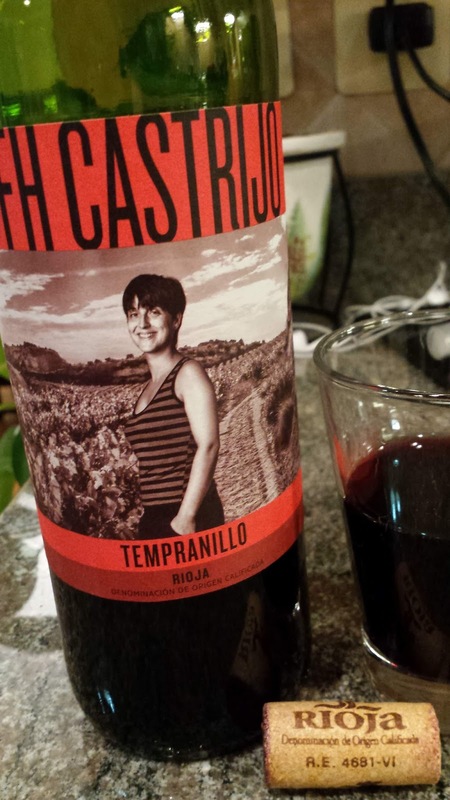 FH Castrijo Joven 2014 Rioja Tempranillo - Also located in Labastida, this family vineyard is now tended by Aintxane Prieto Uriarte and her husband. This is a vibrant wine; mint and chocolate, easy tannins and very approachable. FH Cuvee 2012 Jumilla Monastrell - José Floreal Jimeniz Joulie was born during the the Spanish civil war and tended vineyards because he couldn't attend school. 70 years later he still works every day in Jumilla's desert like conditions. His vines are nearly 100 years old and survive on less than 10 inches of rain per year in the southeast corner of Spain. This is a big spicy wine; it needs to breathe; to allow the textured tannins to settle down. 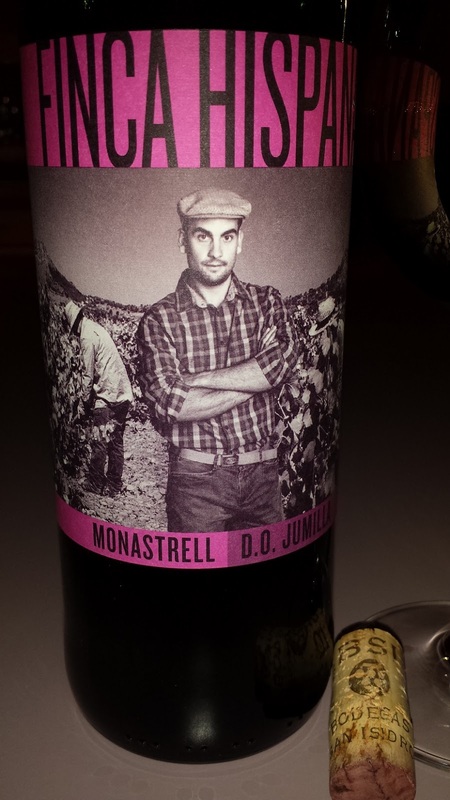 FH Monastrell Joven, 2012 D.O. 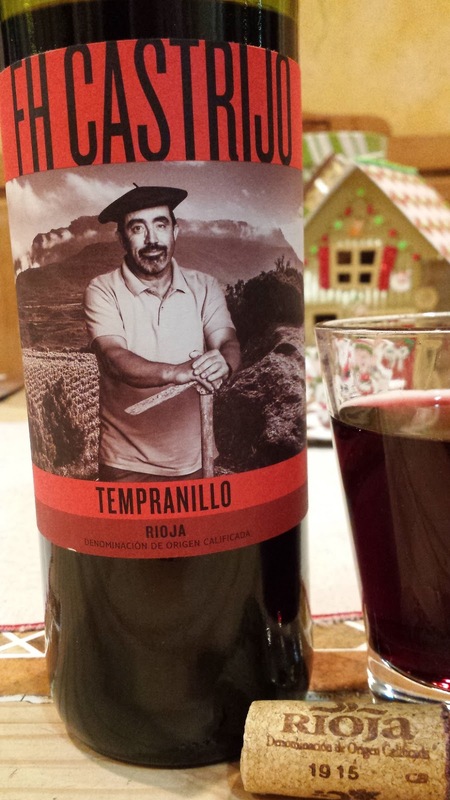 Jumilla - Another wine from Jumilla this one produced by Daniel Guerrero Cruz. It is also a full bodied wine, but not as big as the Cuvee. Instead, there's more jaminess and ripe fruit. I'm sure most of you are familiar with the Discovery Channel's Moonshiners series and have followed Tim Smith's quest to transition from outlaw to lawful distiller. 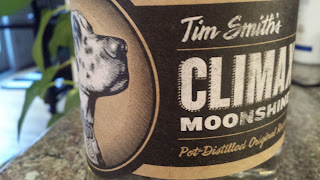 Well, I finally procured a bottle of his Tim Smith's Climax Moonshine ($35, 45%). The whiskey is made at Belmont Farm Distillery, "the First Craft Distillery of American Whiskey in the United States" - located in Culpeper Virginia. The mash bill is a secret but includes corn, rye and barley malt and is distilled using Belmont's historic copper still. The whiskey is hot, so be prepared for a burn, but not a straight alcohol burn. Instead, there's a roundness of creamed corn that envelopes the mouth and throat and that richness continues downwards. Climax Moonshine isn't necessarily a harsh whiskey, it just packs a wallop. Cheers. 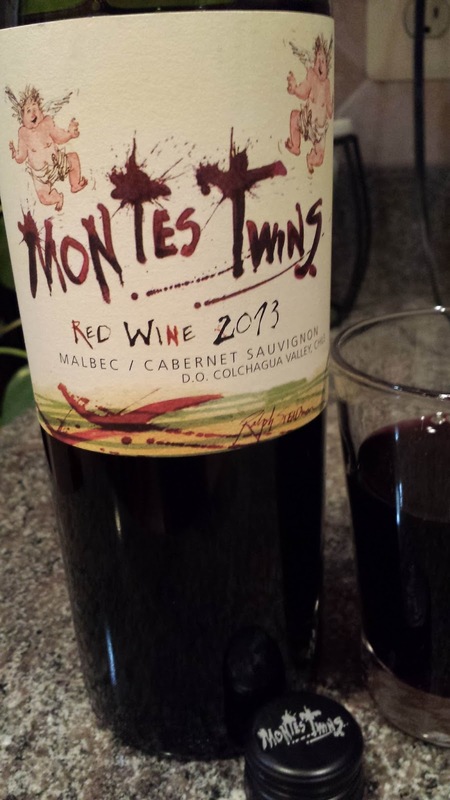 Last week's #WineChat was sponsored by Chilean winery Montes Wines and Aurelio Montes Jr., who featured two entry level wines: the Montes Cherub and Montes Twins. I have written favorably about the winery in the past year and these wines were not an exception. Like the reminder of their portfolio the grapes were harvested from dry farmed vineyards from one of the winery's three estates in the Colchagua Valley. Not only were the wines themselves attractive, but check out the labels. These two were designed by famed artist Ralph Steadman, who many know from his Flying Dog Brewery labels. 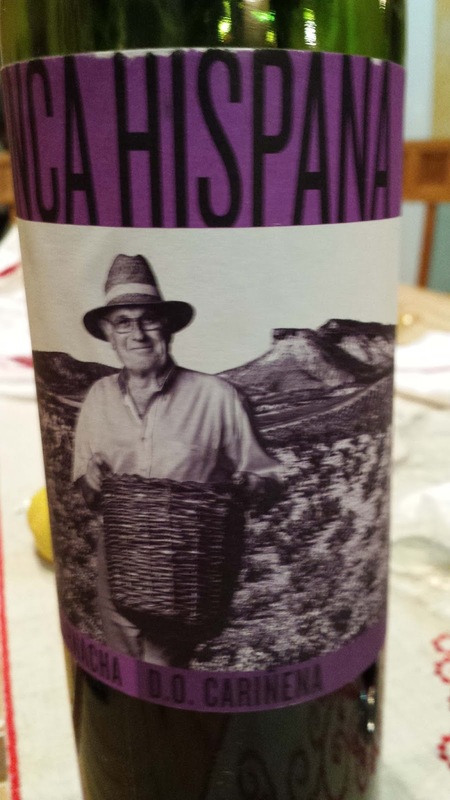 And actually every Montes wine includes an angel on the label as co-founder Douglas Murray believed angels protected him. 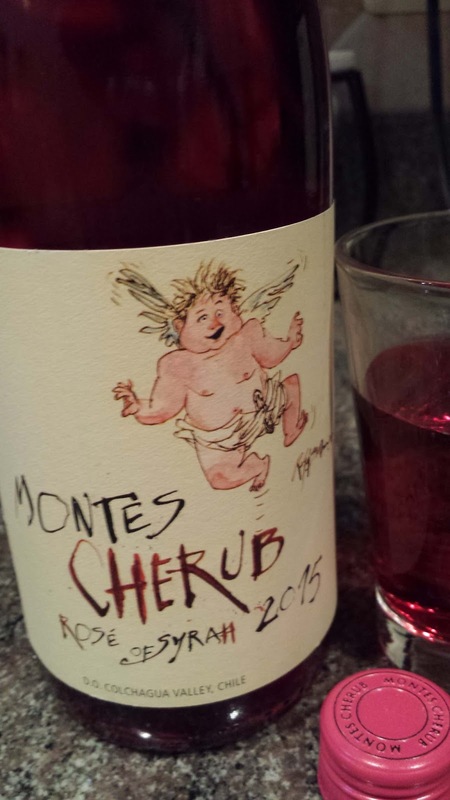 Montes Cherub Rosé of Syrah 2015, Colchagua Valley Chile ($15, 13.5%) - The grapes were harvested from El Archangel Estate, Marchigue vineyard located 25 km (15.5 miles) from the Pacific Ocean coastline. The cool climate and gentle pressing provides a sense of freshness. The wine features a candied apple color which makes the dry strawberry flavors, cracked pepper and a refreshing acidity finish a very pleasant surprise. The label refers to a young angel (cherub) named Alfredo, named in honor of founding partner Alfredo Vidaurre. Montes Twins Red Wine 2013, Colchagua Valley Chile ($15, 14%), Malbec & Cabernet Sauvignon grapes harvested from the Apalta and Marchigüe vineyards. The former estate is located just north of Santa Cruz in the Colchagua Valley. This is an excellent entry level red wine with it's baking spices aroma; juicy plum flavors; and slight pepper on the easy finish. 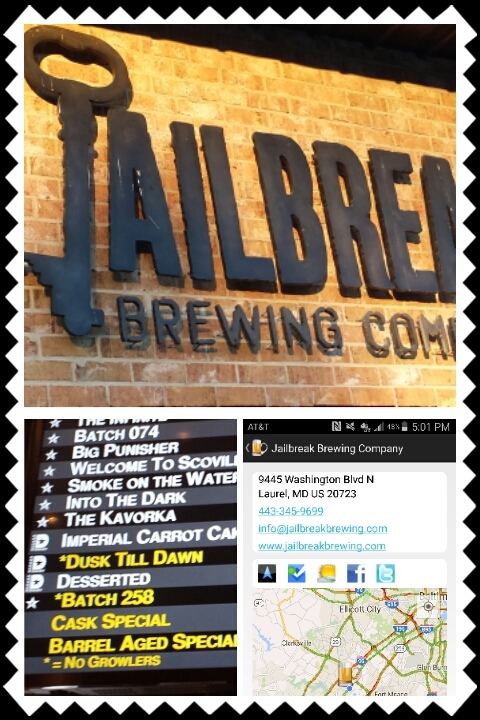 Since it's inception two years ago, Maryland's Jailbreak Brewing Company has quickly become a popular local option for craft beer. Their everyday canned lineup of Feed the Monkey Orange Hefeweizen, Welcome to Scoville Jalapeno IPA, and the Big Punisher Double IPA are distributed widely in the DC and Baltimore regions. And at their spacious tasting room they offer many special releases and cask specials. With a flight scheduled out of BWI we stopped for a short visit where I had the Desserted Chocolate Coconut Porter and the Dark American Stout with Peanuts and Chocolate on cask. These two beers raised my appreciation for the brewery as the porter is on par with or even better than the Oskar Blues Brewery Death By Coconut. The stout on cask took a couple sips to get past the absence of carbonation, but that absence allowed the beer's peanuts and chocolate to dominate the palate. Much better than the DuClaw Brewing Company Sweet Baby Jesus. 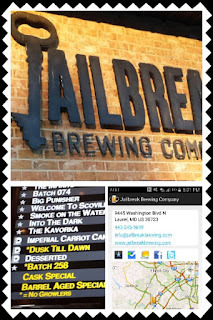 Jailbreak will becoe a regular stop when visiting Columbia or heading to the airport. And as usual, theCompass Winery, Brewery, Distillery Locator Mobile App will guide you there. Cheers. Most casinos on the strip offer a range of craft beer - mostly California brewed and heavy on Firestone Walker Brewing Company, Green Flash Brewing Company, and Ballast Point Brewing Company. 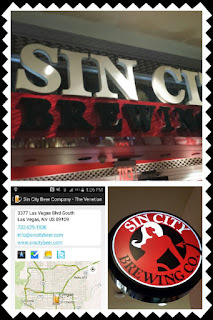 All great options, but if you are looking for a local brew as well as a beer distributed exclusively in Las Vegas then Sin City Brewing Co. is an easy choice. The brewery was "launched by long-time Gordon Biersch Director of Brewing Operations Richard Johnson" and provides three microbrew bars on the strip: Sin City Brewing Co. - Harmon Corner, Sin City Brewing Co. - Planet Hollywood, and Sin City Brewing Co. - The Venetian. The brewery produces five everyday beers and I was able to try a couple at the Venetian location. The Weisse is Nice (Hefeweizen) is a bready, citrusy beer with a bit of spice and the Never Pass Up A Blonde is your traditional lightly malted beer with a tad of saltiness. Both are not bad offerings. Also on the menu is the Say Hello to Amber, The Ale With A Tale (British IPA), and the The Dark Side of Sin (Stout). These will have to wait for next year's Super Bowl when I allocate more time. And as usual, theCompass Winery, Brewery, Distillery Locator Mobile App will guide you there. Cheers. Located in the southern half of New Zealand's South Island, Central Otago is an inland oasis of Pinot Noir growing vineyards. The area is mountainous and the vineyards - the highest in New Zealand at between 650 and 1,300 feet above see level. It is also the world’s southernmost wine making region. Because of it's rugged landscape there are pockets of micro-climates with one if these being the Bendigo Loop Road - home of “Someone’s Darling” Vineyard. 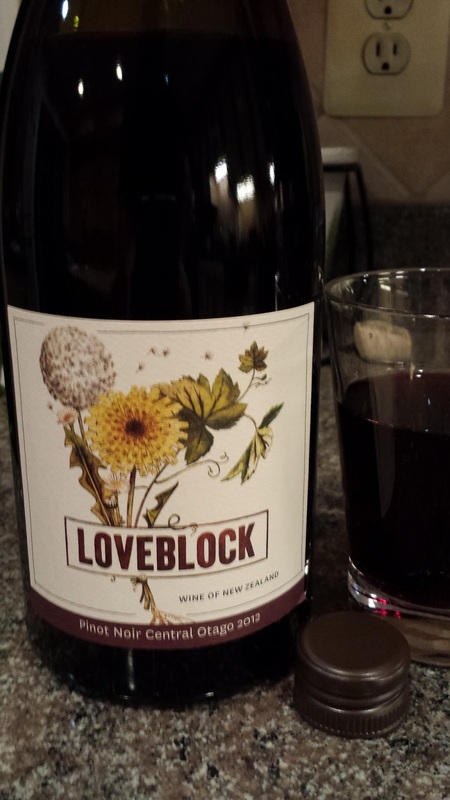 This block is owned by the Marlborough based Loveblock winery (owned by Erica and Kim Crawford) and is Sustainable Winegrowing (SWNZ) accredited. The days are long here with 18 hours of daylight during the summer months and the altitude allows for diurnal cooling at night. The region is dry with sandy soils to encourage water draining. According to the winery, "the climate and unique terroir combined make this area one of the best for producing premium Pinot Noir". 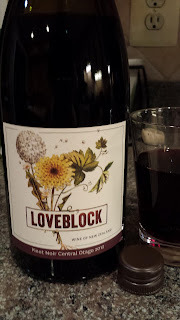 And after sampling the Loveblock Pinot Noir 2012 ($37, 14%) I tend to agree. The wine drifts between savory sour cherries and dusty earth and finishes with dry and lingering tannins. This structured finish is what elevates this Pinot to that SRP. Cheers.